The backstory goes like this: in the 1980s, back when they were new and scrambling to pad out their schedule, Channel 4 commissioned prolific horror author Garth Marenghi and his sleazy agent Dean Learner to produce a horror series. 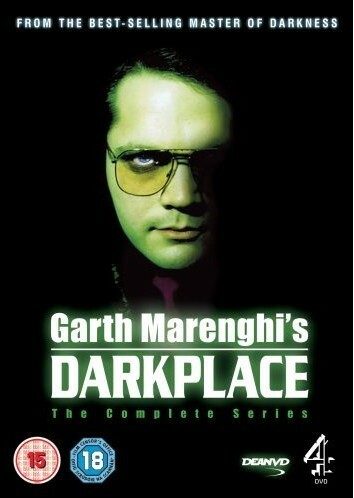 What emerged from Garth’s imagination was Darkplace, a show revolving around a hospital built over the gates of Hell and subject to all the myriad different paranormal manifestations you might expect from such a location – manifestations which the hospital staff have to deal with. Casting himself as the heroic Dr. Rick Dagless, Garth also penned the part of hospital administrator Thornton Reed for Dean and rounded out the core cast with the suave Dr. Lucien Sanchez (Todd Rivers) and the charming psychic newcomer on the ward, Dr. Liz Asher (Madeleine Wool). For their own reasons, Channel 4 decided that the product was not suitable for broadcast – according to Garth, it’s because the material was just too edgy and dangerous, but viewers might come to their own conclusions there. Eventually, in 2004 it was dug up from the vaults and given a limited six-episode showing, with each episode bulked out with an introductory monologue from Garth himself as well as interviews with Garth, Dean, and Todd (Madeleine Wool having gone missing presumed dead in the meantime) to deliver the ultimate fan experience.